Manali, is a small hill station situated at the northern end of Kullu district of Himachal Pradesh. It is one of the most popular tourist destinations of India. Manali is situated at a height of 2050m in Western Himalayas. Lush green apple orchards, snow covered mountains and evergreen deodars trees attract millions of tourists every year. 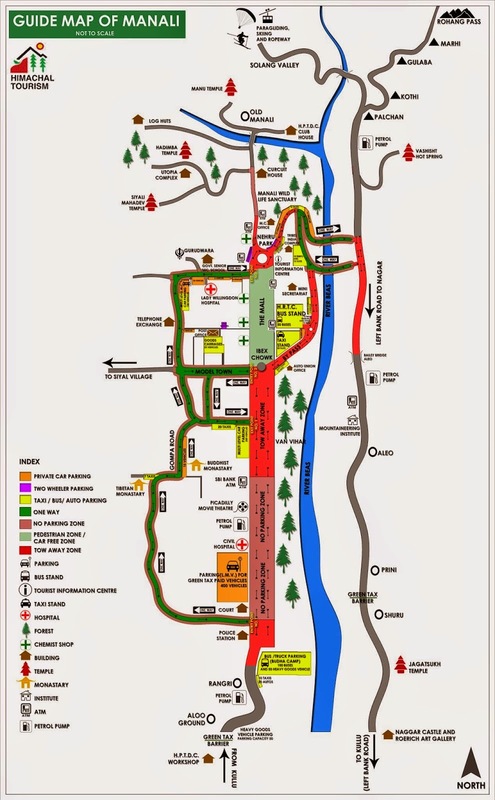 Name Manali is derived from word ‘Manu-Alaya’ which means “the abode of Manu”. Manu was among the family of ancient Hindu sages Saptarishi. Manu recreated human life and nature after the great flood which had washed out the complete world. Every village of manali has its own deities and because of this Manali is also known as “Valley of Gods”. One can get a chance to see these deities during some rituals functions and village fair. Manali is well connected with roads. It is 250 km from state capital Shimla, 310 km from Chandigarh and 540 km from Delhi. Nearest airport is Bhunter Airport which is 50 km from Manali. Nearest railhead is at Joginder Nagar which is a narrow gauge railhead and about 175 km away from Manali. Other broad gauge railheads is at Chandigarh 310 km, Pathankot 325 km, Una 250 km, Kiratpur Sahib 268 km and Kalka 275 km. Manali is paradise for adventure lovers. Paragliding, white river rafting and river crossing are some adventure activities in Manali which everyone wants to enjoy while they are in Manali. There are plenty of short and long treks which start from Manali. Trek to Hamta Pass, Beas Kund and Bhrigu Lake are some of the famous treks. In winters when slopes of Solang Valley are covered with snow, tourist enjoys snow activities like skiing and snowboard. Taxi for Local Sightseeing in Manali.